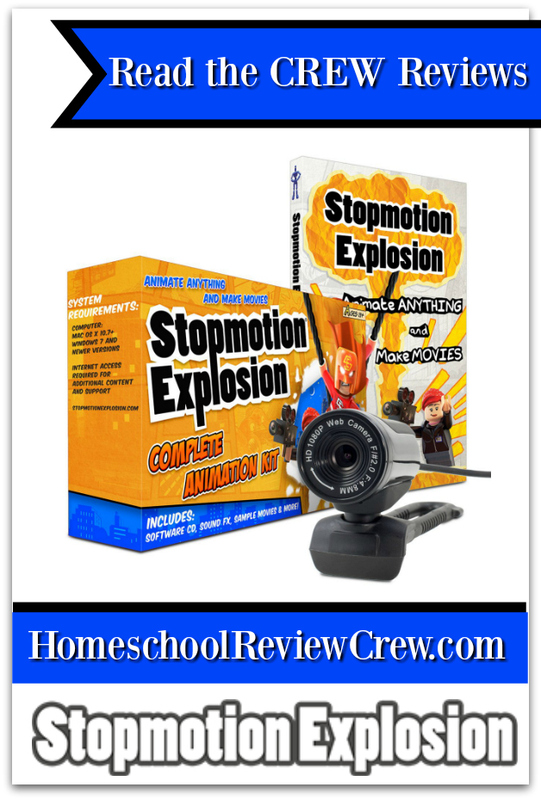 My kids enjoy putting on plays and telling stories, so I knew they’d be thrilled to review the Stop Motion Animation Kit from Stopmotion Explosion. We received a complete animation kit to review from Stopmotion Explosion. It included everything the kids needed to get started making stop motion films. There was even a web camera that you could hook up to a computer and use for recording. We didn’t use that, as we felt it was easier to set up a smartphone on a tripod. The app they recommended was easy to install and use. The animation kit made a fun supplement to our language arts homeschool. The kids had to think through a scene they wanted to animate, and work to create the video. It took a lot of patience! Each move had to be made slowly and carefully, so no other props got knocked down. It took several attempts for them to get the hang of it. But, once they did, they added this into their free time rotation. As long as I wasn’t using my phone, or if my oldest let them use theirs, they could record videos. There were some suggestions for backgrounds and things in the accompanying book. My kids decided to use a blanket. They went with green to have it represent grass. Another idea they shared involved using a brown blanket to be dirt. After reading the Quick Start Guide with my kids, I turned them loose. My oldest and youngest girls decided to record a video for Sibling Playtime that day. They brainstormed for a bit, and talked through a simple plot. Then they set to work gathering props. They decided to use a combination of different Lego figures, including a dragon. Here is a shot of what their scene looked like. They arranged the Legos on the blanket. My oldest had the tripod right next to her, and carefully pushed the button each time it was needed. My little girl helped move the figures and ensure no one else came close enough to bump the tripod. In their video, the dragon comes to visit the other animals. She was a friendly dragon. It took about ten minutes for them to get all of the still images they needed. Then it took less than two for them to turn it into a shareable clip. They had so much fun! I really appreciate that this was able to engage kids of all ages. It gave them something to talk about and plan, and I enjoyed watching them collaborate. Ellie decided she wanted to make a stopmotion clip of her own. She set up in the kitchen, once again using the smartphone on a tripod. She decided to film My Little Pony figures. Her Pinkie Pie kept falling down because of the thick blanket, so she struggled a bit to keep everything where it was supposed to go. You can see the pink pony fall down in the video. One nice aspect is that you can see outlines of your last shot from the app on the phone. This helped her sort of keep things lined up. The Stop Motion Animation Kit has made a wonderful, creative building addition to our homeschool. It’s a way for the kids to bring their stories to life. They will continue using this product to create stop motion clips. I was one of 40 reviewers for this product. To see what other homeschooling families thought, please click on the link below.